Refurbished Nikon D600 DSLR camera is currently listed with a new low price of $1,299.99 with free shipping and one year warranty (via Cameta Camera). 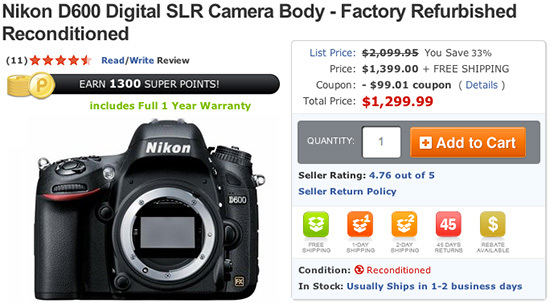 The deal is available only trough this buy.com/rakuten.com link (the same camera is listed for $1,399.95 at Cameta Camera). For a list of all refurbished Nikon products, visit this dedicated page.